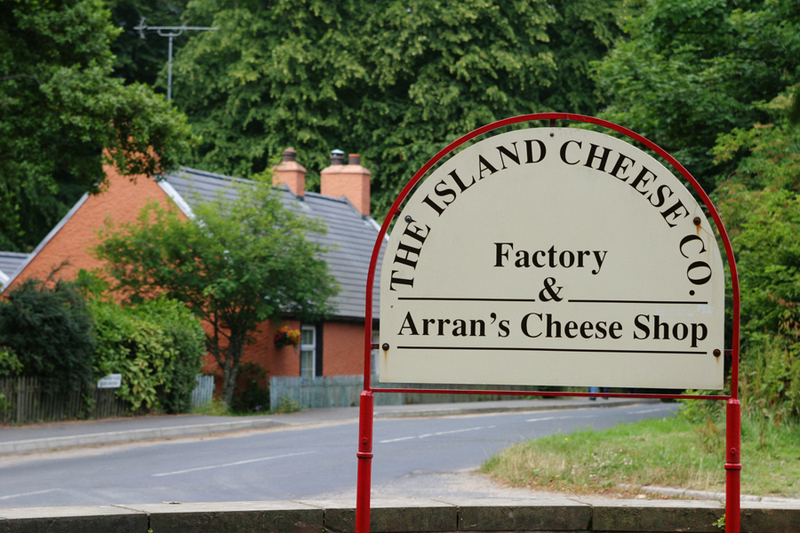 For dessert, I order a trio of Arran cheeses, including the whisky cheese, along with a dram of 10-year-old single malt Isle of Arran. Sipping my water of life, I feel expansive. I feel emotional. I feel as if I am exactly where I should be at this moment in time, and whether it’s the north coast lobster, the Arran cheese, or, more likely, the warming whisky, I couldn’t tell you. Nor does it matter. Driving back to the Glenartney, Charles seems to sense my Scottish euphoria. Without saying a word, he ignores the turnoff to our hotel and keeps driving along the coast. It is 9:30 on a late summer eve in Scotland but it is still light out. The gloaming. The most glorious time, in my mind, in all the day. 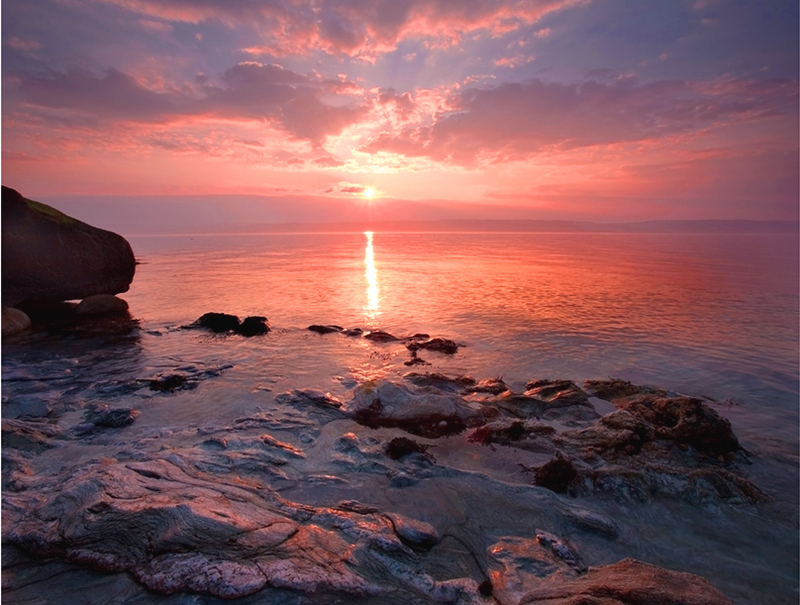 The sky is layers of orange, purple, and pale blue, particularly towards Goat Fell, the barren, stoney hill that is the highest mountain on Arran. The gloaming on the isle of Arran. We drive and drive along this Great Wee Road out into the country until suddenly Charles slams on the brakes and we come to a halt in the middle of nowhere. Have we hit something? Has the car broken down? Without saying a word, Charles gets out of the car. I follow. He is staring off towards the sea. I follow his gaze to a green pasture sloping gently down to the shoreline. There, just on the other side of the fence, are two silent, magnificent hairy coos staring calmly at me, a mother and her calf. “Oh my god,” I whisper. A mama hairy coo, top, and child on the isle of Arran. Photos by David Lansing. Charles smiles but doesn’t say a word. 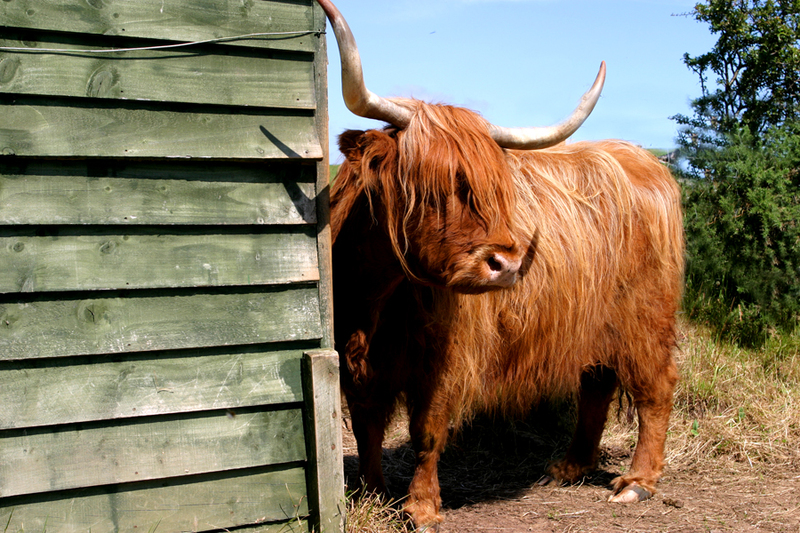 I cross the country road and stand at the fence, close enough to touch the mother hairy coos. She is stoic and serene and wise-looking. Like the Queen Mother herself. Or a bovine Buddha. Standing there before them is as close to a spiritual experience as I think I’ve ever had. I half-wonder if they are going to start talking to me, telling me what to do with the rest of my life. “Should I stay or should I go?” I ask them. The hairy coos are elegantly silent. Back at the Glenartney, I find that I am so contented I can hardly stand it. While Charles goes off to his room, I head off to the lounge, which is little more than a home bar, and ask Robbie to pour me an Arran whisky with just a wee touch of water. I take my whisky out into the garden and sit in an old rickety wooden garden chair facing Goat Fell, sipping on my single malt and thinking about my time in the Hebrides. There’s a lot that happens emotionally to me when I travel. It’s not really all about finding the perfect dram or listening to the stories of old coots or hoping to spot a hairy coo, though, of course, that’s all part of it. It’s more about what happens inside you. It’s about the thoughts you have and the cinematic dreams that come over you at night when you’re outside your comfort zone. 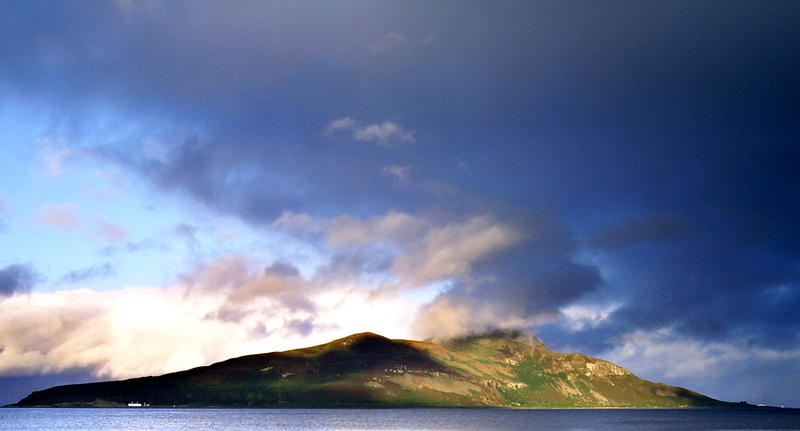 Sitting in the gloaming, drinking my whisky, I imagine taking a spiritual retreat at the Buddhist sanctuary on Holy Isle. 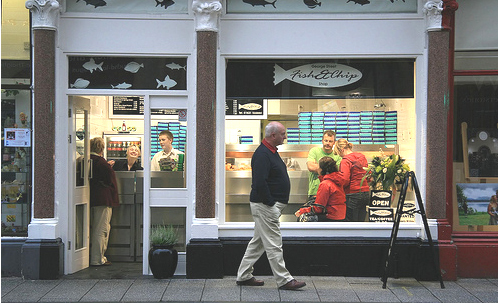 I contemplate grounding myself for a year in some small village like Port Ellen and maybe buying the pub where, years ago, an Irish artist painted a mural of Islay scenes depicting the locals in exchange for a dram—or two—of whisky. I wonder over the possibility of living in Barnhill, George Orwell’s old stone house on Jura and looking for the Future Stone. I sip my whisky and I think hard about all the possibilities before me. Here on a small isle on the western coast of Scotland. And I’m really thinking about it, Graham. All of it. The Scots are mad for their walk-abouts. If they spot a stretch of open country or, even better, a hilly moor, they’re off and about before you can say Give me my walking stick. Last night, while I was sitting in a rusty old chair in the garden of the Glenartney Inn, Charles was swapping stories with the owner, Robbie Mallinson. 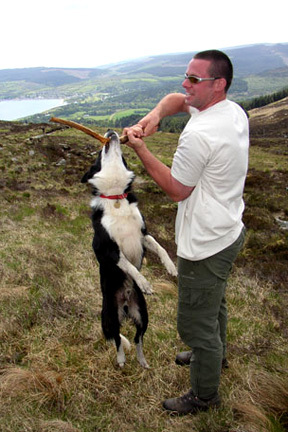 But the light was fading and Robbie needed to take his dog, Zak, out for a walk. Which, of course, suited Charles just fine. So off they went. Zack the dog getting the hang of things on a walk with Robbie. I mention this because it seems that during their walk Charles divulged the futility of our search for a hairy coo. Not a problem, said Robbie. There are hairy coos at the Isle of Arran distillery. They use them to keep the grass clipped. Perfect. So this morning, after tucking into a substantial FSB prepared by Robbie’s wife, Angela, we were off to the distillery. As Robbie suggested, there were in fact livestock roaming the grounds munching at the grass. But they just happened to be sheep, not hairy coos. Seems everyone in Scotland has a problem differentiating livestock. 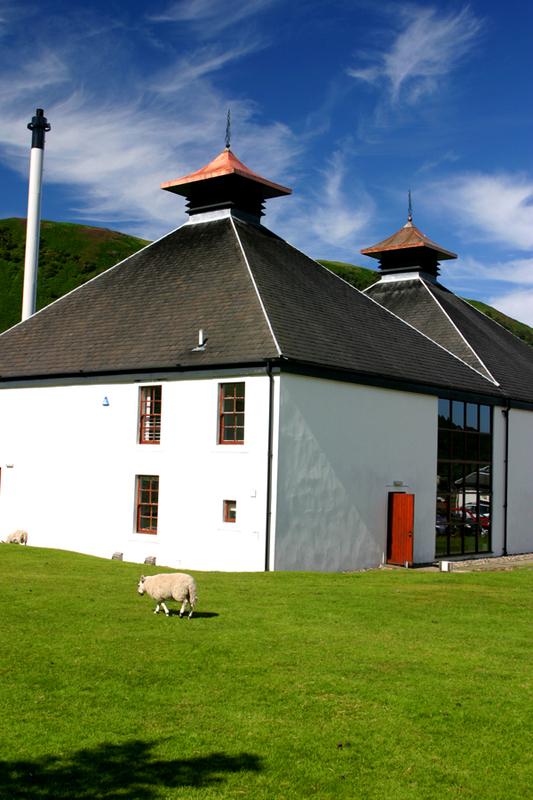 Sheep--not a hairy coo--at Isle of Arran distillery. Anyway, since we were here, we thought we might as well peak in at the visitor center where we ran into the manager, Gordon Mitchell, a wee chap who rocks back and forth on the balls of his feet when he talks, lifting up on his toes to emphasize this point or that. He was anxious to give us a tour. Having gone on a half-dozen tours already, I tell him we can dispense with one more, but he’ll have none of it. He wants to show us everything: his office, the stills, the gift shop, but most importantly, the locked cellars where hundreds of oak casks hold thousands of gallons of whisky. With the excitement of a child stumbling towards the yuletide tree on Christmas morning, Gordon takes us to a corner of the cask warehouse, standing proudly before three barrels above his head. The first two are single malts from 1997 that are owned by Prince Harry and his brother, Prince William, their names stenciled in white. Next to those is a third cask owned by the actor Ewan McGregor. The casks are like newborn triplets and Gordon the proud father. And, in fact, this is a whisky nursery of sorts. All around us are other people’s whisky barrels, their signatures and dates scribbled on them like autographs in a baseball program. Each barrel, which holds about 100 bottles of whisky, is owned by an individual. Or a couple. Or a group of friends. It’s the distillery’s unique way of raising funds to finance the enterprise which started up 14 years ago. Own your own barrel of whisky. It costs 1,200 quid for your own cask—about $2,000. And you have to wait three years for it to age (although you can leave it at the distillery to age for as long as 10 years if you like). But at the end, you get 100 bottles, with your own label on it. I consider the possibility: Lansing Single Malt Whiskey. When we leave the distillery, I notice that Charles is unusually quiet. He admits he’s a bit down on himself for not having produced a hairy coo for me, especially since we leave the island tomorrow. Thinking a walk-about might cheer him up, I suggest we stop at Lochranza Castle and go for a hike around the bay. Charles doesn’t seem too enthused but stops anyway. It’s not much of a castle, Lochranza. Just a big pile of stones, really. Originally a fortified two-story towerhouse, with lodging upstairs and a barn on the ground level, it was probably built early in the 13th century. When new owners took over a couple of centuries later, they did what all new owners do: remodeled. Which is when it became a castle of sorts. 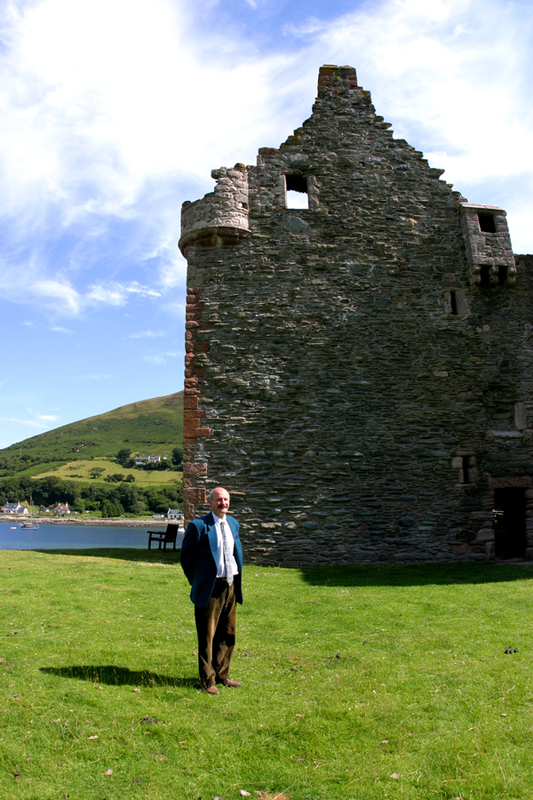 Charles Hunter at Lochranza Castle. Photos by David Lansing. Anyway, while I’m sitting outside the castle soaking up some rare sun, Charles is poking around the structure, seeing what he can see. When he finally comes over to me, he’s much more chipper. How can I not be? Even if I no longer believe they really exist. 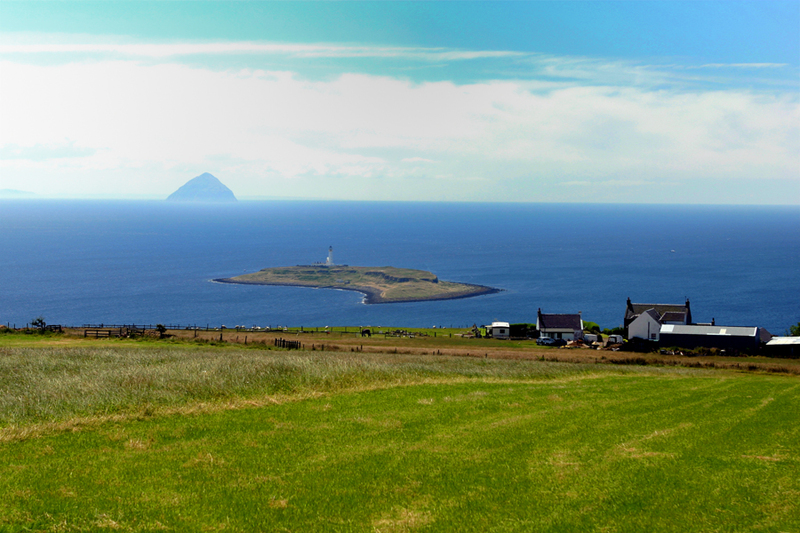 I’ve decided we need to go to the Isle of Arran, separated from Islay and Jura by the Kintyre Penninsula, part of the mainland. I want to go there because Charles says it’s the best place to see hairy coos. 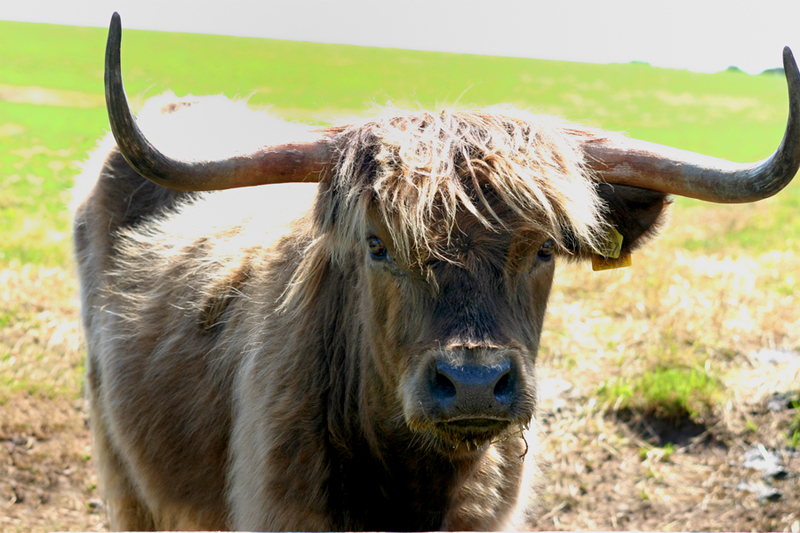 Officially called Highland cattle, hairy coos have shaggy reddish-brown hair and dopey eyes, mostly hidden behind their bangs, and look like they ought to be characters in a Muppets movie. All this I’ve gleaned from looking at countless postcards of hairy coos wherever we’ve been. Everyday Charles has said, “Dunno’ worry, we’ll find you a hairy coo today.” But I’ve yet to see one on anything other than a postcard. So yesterday we headed for Arran. Once off the ferry at Lochranza, we drove a GWR along the western coast, watching gannets divebomb for their Sunday brunch in Catacol Bay, before stopping at a cheese shop near Lamlash. We are the only ones in the shop, except for the clerk, an elderly librarian-type who, from the way she follows me around, seems to think I’m here to make off with as much Hebridean herb cheddar cheese as possible. 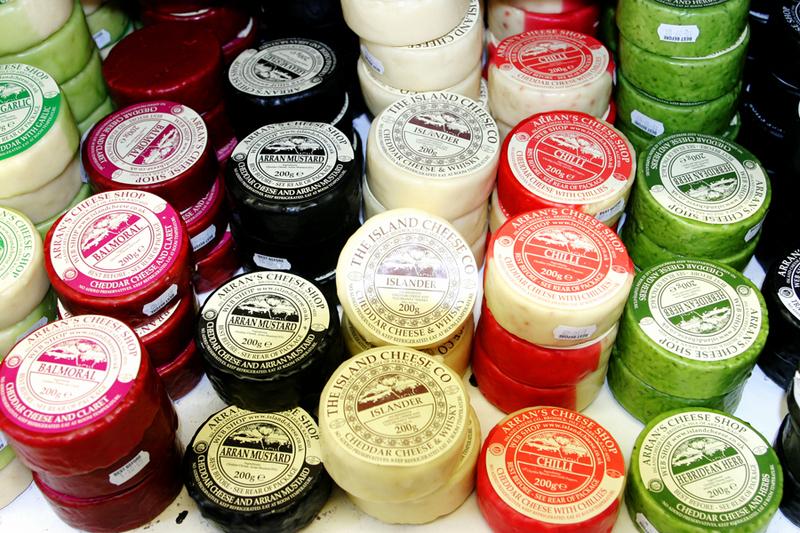 There’s a mustard cheese and a garlic cheese and a claret-flavored cheese, called Balmoral, all wrapped in a green or red or black waxy coating, but best of all there’s a whisky cheese called Islander. I tell her I’m taking a picture…of the cheeses…with, you know, a camera. She looks at me in disgust. “Is there a problem?” I ask her. “I would ‘av thought you’d ask first,” she sniffs, arms crossed over her heaving chest.